I’m completely obsessed with photography on Google+. So, when I saw a post from one of my favorite photographers, Thomas Hawk, promoting a photo walk around San Francisco, I jumped at the opportunity. 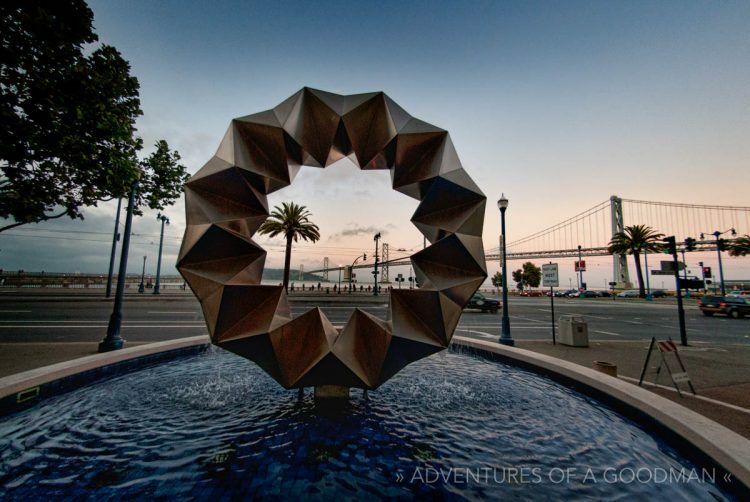 On the night of August 10, 2011, I joined nearly 30 of my fellow Google+’ers as we wandered from San Francisco’s SOMA (South of Market) district down to the Embarcadero waterfront area in front of the Bay Bridge. San Francisco’s Bay Bridge during the blue hour with a 6 second exposure at 12mm, cropped for effect and post processed in Photoshop. Our evening began with a delicious meal at Henry Hunan’s Chinese restaurant where photography talk flowed freely at my table. Shout outs to Michelle Arevalo-Carpenter, Doug Kaye, Eric Z and Scott Jarvie. After the feast, we began to stroll down Howard Street, though it took only a few seconds before most of the group stopped at a construction site to take some pictures. When the walk part of the photo walk continued, I had the pleasure of getting to know Kieran Sean Fitzpatrick and Eric James Leffler as we continued to stop every few feet to document the vibrant businesses along the way. The next photo is one of my favorites, which I captured by bracing my wide angle lens up against a windowsill of a wine bar, pressing the shutter and hoping for the best. Reflections from a fisheye lens of the front door of a swanky restaurant. I found myself amazed at how many buildings in San Francisco’s SOMA neighborhood had beautiful and large abstract sculptures in their courtyards. Below are a few of my favorites. At one point, the group came across some weird construction device that looked almost like an oil rig. No one was completely sure what it was, but we knew that it needed to be photographed. Not content to just take photos of inanimate objects, Charli took one for the team and jumped over the wet cement and climbed up the dirty machine to be our model. Break Out the Tripods; It’s the Blue Hour! A large collection of tripods were set up when the group finally made it down to the San Francisco waterfront to photograph the Bay Bridge and Ferry Building, just in time for the Blue Hour. Sadly, I left my tripod at home, so I had no choice but to balance my camera on whatever was around, using lens caps to give me the desired angle. As is often the case with larger groups, people began to wander off to photograph whatever parts of the San Francisco skyline appealed to them. Before I knew it, it was just me, Chris Luckhardt and Kevin Curtin hanging out on a pier, snapping away and discussing life. So to any of my fellow Google+’ers reading this…it was an absolute pleasure getting to know you. Hopefully our paths will cross again, but in the mean time, keep on snapping away and see you on the +. Follow me on Google+ for exclusive photos of the day, stories and more.